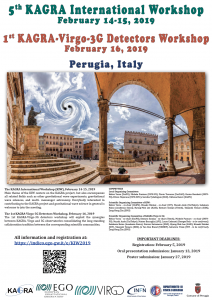 The 5th KAGRA International Workshop will be held in Perugia the 14th and 15th of February followed by a connected workshop on KAGRA, Virgo and 3G Detectors the 16th of February. Main theme of the KIW centers on the KAGRA project, but also encompasses all related fields such as other gravitational wave experiments, gravitational wave sciences, and multi-messenger astronomy. Everybody interested in contributing to the KAGRA project and gravitational wave science in general is welcome to join the meeting. The 1st KAGRA-Virgo-3G detectors workshop will exploit the synergies between KAGRA, Virgo and 3G observatories consolidating the long standing collaboration tradition between the corresponding scientific communities.